The Berlin art scene might be the most exciting and dynamic on the planet. This small-group tour, led by an art historian, takes you to several galleries in and around Berlin's Mitte neighborhood over the course of three hours. 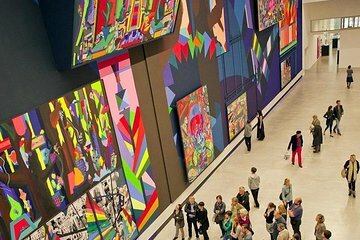 On this morning or afternoon tour, learn about how and why the art scene has flourished and become a hot spot for creativity in Germany's capital since the fall of the Wall in 1989. Along the way, you can listen as the guide puts what you see into historical context. This 3-hour tour brings you to the most notable gallery hubs of Berlin, with the course of the tour adapting to the current shows and major art events of the season.